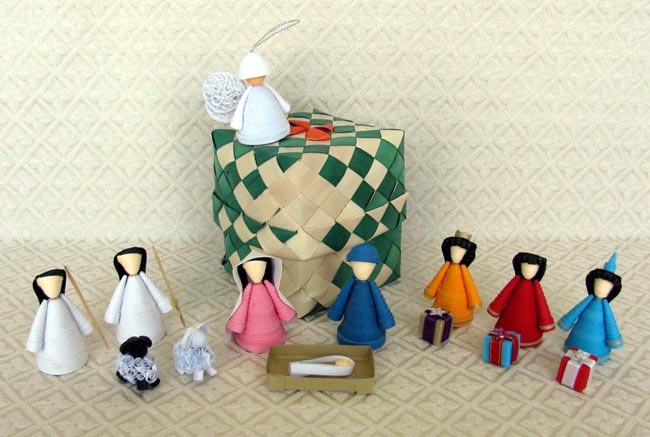 The small paper figures in this Nativity are made using an art form called quilling, which uses tiny strips of paper that are either twirled, rolled, or shaped before being glued together. Even though the figures are small, the attention to detail is impressive; the amount of work in quilling the tiny rolls of paper used to make the sheep's woolly bodies and the angel's intricate wings is mind-boggling. The set contains 11 standing figures: Joseph, Mary, baby Jesus, three wise men (plus gifts), two shepherds, two sheep, and an angel with hanger string. The angel would look great hanging from a stable or small tree, or the hanger string can be cut off. The set comes packaged in a colorful wicker box, pictured. Joseph stands 2.25 inches tall. This set previously cost more because it included a stick stable. Unfortunately, the stable is no longer available. The Nativity was made by a young man named Chum Seyha. He always enjoyed school and expected to continue his education at a local university in Phnom Penh, Cambodia after graduating from high school. Instead, due in part to lack of funds, Seyha took a job as the manager of a small team at a greeting card company. As he researched new product ideas, he was intrigued by the art form of paper quilling. Seyha ​learned to quill, taught his team, and began to make and sell quilling products. He hopes that his new skills will allow him to fund his university education.